In a bid to ease traffic movement, Hubballi-Dharward Police Commissionerate (HDPC)is planning to fix electronic variable display signs in Hubballi. Apart from information on traffic situation on roads, police will also use the displays to educate people on traffic rules. HDPC also has plans to install 1000 cameras across the twin-city under the ‘Safe City Programme’ for city surveillance and traffic regulations. 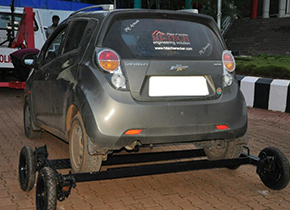 Hubballi-Dharwad Police Commissionerate has also introduced two new towing vehicles for seizing four-wheelers parked in “No Parking” zones, to streamline the vehicular traffic in busy areas. In addition, they have a special mechanism to lift the rear wheels of the cars also. The Commissionerate also plans to procure a command vehicle with cameras and other surveillance facilities for better policing. This vehicle to be purchased would be used during processions, protests, VIP movement and on other such special occasions, he informed.